What is Separation Anxiety in Dogs and How Can You Make it Better? While it should come as no surprise to most people that their dogs are smarter than they seem, the idea of separation anxiety is still not widely accepted. Though there are horror stories of dogs that were left along for long periods of time, some owners attribute it to simply bad behavior and something that should be accepted as part of the dog. But just like humans, dog can suffer from mental anguish that needs special treatment. Instead of simply thinking that separation anxiety is caused by inherent animal instinct, maybe it's time to think about it as something you can help your dog control. Dogs are naturally social creatures; they like to be with other people, other dogs, and other stimuli. When they are left by themselves without anyone to interact with, they can often become restless and prone to bad behaviors. What happens is that when a dog becomes attached to a certain person, they want this person to be around them all the time. This makes sense. But when the person does leave them alone, the dog can begin to be anxious about this separation. They can begin to think or wonder if their owner is ever going to come home. This anxiety can manifest itself in a number of different ways and is often seen when dogs are left alone for only hours at a time. But separation anxiety can also be triggered by a traumatic event in the dog's life - i.e. illness, change of owners, abuse, etc. The good news is that separation anxiety is treatable with a number of different therapies. So if you notice that your dog is a bit clingier than they used to be or you realize that you have time away from home coming up, you need to start taking steps now. It's fairly obvious when your dog is trying to get your attention. They'll bark, they'll yelp and they'll simply do anything that seems to keep your attention on them. While you might think these behaviors are normal, you can note that they only occur when you are leaving the house or when you are out of the same room as the dog. When you start to notice these signs, you may have a dog that is experiencing separation anxiety. They simply want to be around you, so the anxiety they are feeling is manifesting itself in these destructive behaviors. For example, they are scratching at the door because they want to find you or to see you. One of the first things that typically happen when the dog begins to show signs of separation anxiety is that the owner tends to yell at them and punish them for the behaviors. And while this seems like the right thing to do, it can cause several things to happen. First, the dog can begin to see this attention as a good thing, so they continue the behaviors as a way to get you to interact with them. Or two, the dog can become even more anxious - this is especially true when the dog has come from an abusive background. You also don't want to put your dog into a crate when you leave for a few hours as this is not only upsetting to the dog but can make separation even more intense for them. * Don't make a big fuss when you are leaving in the morning or coming home at night. This will help calm the dog down and not make one part of the day more exciting than another other part. * Desensitize your dog to your absences by leaving the room for a few minutes and then coming back, getting your keys, then coming back, etc. This will help your dog realize that you are coming back. * Let the dog know that you'll be back by saying something of that nature every time you leave. The dog will begin to associate this phrase with your return. If no matter what you do, your dog does not seem to be able to calm down when you leave the room or your house, you might want to ask your vet if you can start your dog on a short term drug therapy program. Medications like valium can be used in conjunction with separation anxiety training to help your dog begin to settle down. About Author: Grant Eckert is a writer for VetRxDirect. VetRxDirect is a leading provider of Pet Medications. Seven Top Steps to Handle Labrador Anxiety Before It's Too Late! Labrador anxiety has to be stopped immediately because it can develop into serious situations which you cannot handle yourself. Primary causes for this condition are usually,people, other animals, places and situations. To avoid worst situations, you have to block the development of your Labrador's anxious behavior before it even starts! Labradors long for companionship, time and attention from their owners. Leaving them unattended for long hours will most likely result to exhibition of unusual behavior such as incessant barking, digging, pacing scratching and many others. If not addressed properly, Labrador anxiety can greatly affect the development of a rewarding relationship between you and your pet. Be able to recognize Labrador anxiety through visible symptoms. This condition can result from various factors; however, the most triggering cause would be separation or lack of attention. Routine changes, new environment, improper nutrition and allergies can also contribute to the development of separation anxiety. You will know if your pet is suffering from Labrador anxiety through the actions that he displays. The most common signs for Labrador anxiety includes incessant barking, whining, howling, improper elimination, inactivity, and the occurrence of destructive behavior. Seeing you leave the house can be a big deal for your pet. Making it look like such a big event will only increase risks of Labrador anxiety. Labradors usually develop a strong bond with their owners. It is not recommended for you to give your pet any extra attention before leaving the house. It will only make your dog think that you might be away for long. Remember that your dog does not understand why you have to leave. For starters, there is a need for you to ensure him of your return every time you go out of the house. You can also prevent Labrador anxiety by discouraging the anxious behavior. It is more likely that your dog will follow you around the house whenever he feels that you are about to leave. The best way to deal with this is through ignoring your dog for the first 10-30 minutes prior to your departure. When you return, repeat the process. Prevent Labrador anxiety by keeping your pet occupied while you're gone. It is necessary to provide your pet with positive distractions to ease distress on his part. You can give him toys that stimulate mental activity to keep him busy. As you spend time with your pet, it will be easier for you to know what he wants and need. Maintaining a regular exercise is also essential. Physical and mental exercises are necessary to prevent Labrador anxiety. You can start by making your daily walks longer than usual or by lengthening your pet's playtime. This is a good way to relieve your dog from stress and tension. When your pet is tired, it will be easier for you to give off commands. Practicing short intervals of your departure and return can help block Labrador anxiety. Start by leaving home for a few minutes. Stay out for a while then return home afterwards. When your Labrador is familiar with the routine, he will most likely develop the assurance that even if you leave the house, you will still return afterwards. Gradually increase the duration as you do this daily. By doing this,there is a lesser chance for your dog to develop anxious behavior every time you leave. Crate training is an essential tool in dealing with Labrador anxiety. Upon your Labrador's arrival, you can introduce him to his crate first so that he can immediately develop a positive association with it. Make the crate look enticing enough for your dog to consider staying on it. During his first days with the crate, spend time with your pet and ensure him that the crate is a place he can enjoy with you. Play with your pet and feed him in his crate so that he can develop a positive attachment to it. Make him feel safe and secured in his own private space. Every method in dealing with Labrador anxiety requires repetition and consistency. Once you start training your Labrador in becoming a well-behaved pet, the process must keep going as he grows. Due to the numerous choices of training methods available for you and your Labrador, you have to explore which one would be best applied. Remember that Labradors are different from one another and a method that is successful for one may not be in the same case with another. Take time to search and find the most appropriate method that fits your dog's needs. By following the steps listed above, you should be able to deal handle Labrador anxiety easily and effectively. Have you ever tried to name a dog before? Finding the perfect name for your dog isn't easy is it? You want to choose a name that goes well with your dog's specific personality and appearance, and not just some overused generic name like "Rover" or "Bingo." Below is a list of some interesting Labrador Retriever names for each of the three main colors Labs come in: yellow, chocolate, and black. Even if you don't choose one of these names, hopefully they can serve as an inspiration for you to come up with a name of your own that you think really suits your pup. · Coal. A classic for a black dog, especially one that is likely to end up on Santa's "naughty" list. · Domino. A playful name for a black dog that is good at getting things going. · Liquorish. Can be for a male or female - a sweet dog with a slightly playful nature. · Olive. A lighthearted name for a lighthearted Lab. Variations include Oliver and Olivia. · Panther. The name of a sleek, beautiful, stealthy, and dangerous animal. · Pepper. Cute and playful for a black Lab. Sergeant Pepper is another possible variation on this name. · Vader. If you're a big Star Wars fan, this is a great name for your black Lab. Evil, but still lovable, and always quite a character. · Buttercup. This yellow flower is also the name of the heroine in the classic movie, "The Princess Bride" and is a great name for a female dog that likes to be treated like a princess. · Butterscotch. A classic for a yellow Lab that can be used for both males and females. · Daffodil. A good name for a sweet yellow female. · Flash. An especially apt name for an energetic yellow Lab that is always dashing around the house like a flash of lightning. · Goldilocks. A brilliant name for an innocent-looking female pup that somehow always manages to find herself in trouble. · Nacho. A funny and unique name for your yellow Lab. · Ray. This is a good name for the Lab that is a ray of sunshine in your life. · Cocoa. A classic name for a male or female chocolate Lab. · Coffee. Great for a hyper chocolate Lab that always acts as if it's hyped up on caffeine. · Godiva. A unique and interesting-sounding name for a chocolate Lab. · Hershey. Yet another brand of chocolate that makes for a great dog name. · Kit Kat. 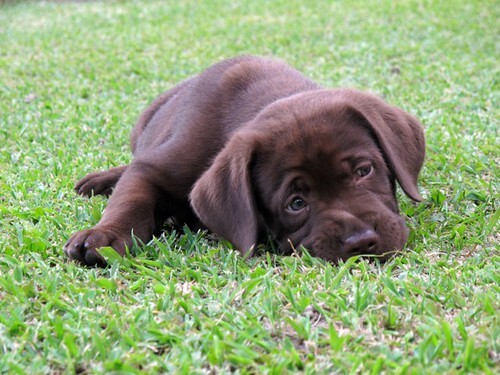 This is a cute and playful name for a sweet chocolate Lab. · Tootsie. Another cute name for a female Labrador. Other variations include Tootsie Roll and Tootsie Pop. Finding the perfect name to incorporate all of your Lab's amazing qualities can be difficult, but hopefully this list of Labrador Retriever names has been of some help. If you don't find a name you like here, just try to focus on your dog's personality and unique traits, and the perfect name is sure to come to you eventually. Find out more about the Labrador breed from an owner of many years. Visit http://www.labradorfamilypet.com/ where you can sign up for a 10 part mini-course about Labrador Retriever care and training. At a time when money is tight and families across the country struggle to make their incomes last the month, it is our pets that are in need of the most protection. This is because those pets who are not insured against illness or injury are either abandoned or even worse put down by their owners. This is the shocking discovery made by Sainsbury’s Finance, which revealed that 51 per cent of vets interviewed said they have had to put down an animal simply because their owners could not afford the medical costs. In this video from price comparison site MoneySupermarket.com, Sheila Stewart from Capricorn Animal Rescue centre talks about how they have seen animals left in such a bad way because they either cannot afford the vet bills or are simply to ashamed to take them into the veterinary clinic. Pet insurance does not only cover your pets health, it also protects you, the owner from other forms of financial loss. Have a look at the list below for a number of items that you will be covered for. Veterinary Costs – Naturally the most important fact of a pet insurance policy is that it covers the medical costs for treatment to your pets. Death Benefit – Either your pets market value or the amount which you bought the pet for is paid out if you pet dies as a result of an illness or accident. Accidental Damage – If you pet caused damage to someone else’s property then your pet insurance policy could cover the cost to replace the items. Third Party Liability – This would protect you ultimately from being sued as a result of your dog causing a car accident in which someone was seriously hurt. Theft/Straying – Again either the market value or the price you paid for your pet is paid out in the event that your pet is stolen or goes missing for more than 28 days. Advertising/Reward – Whilst your pet is missing your pet insurance policy will cover the costs of advertising and even offering a reward. Boarding Fees – This will cover the costs involved with your pet staying over more than four nights in a hospital after having treatment or surgery. Holiday Cancellation – Usually this will only pay out if your pet needs a life saving operation but if you had to cancel your holiday then you could recoup the full cost of your holiday. An unresponsive dog deserves a good handling. A gentle and humanizing treatment over your dog doesn't need any introductions - but these nine methods do. 1, Start training your dog early. Explore on learning the latest -- yet quickest tricks on how to treat an unresponsive dog. Note: older dogs are believed to be susceptible in learning new tricks. However, the older your dog is, the more chances of learning tricks that are most likely to be trickiest. 2. Rely on using motivational or positive methods in training your unresponsive dog tenderly and compassionately. Tip: keep your "obedience sessions"; with your dog upbeat so that the whole treatment will be enjoyable for both parties (you and the dog). If training an unresponsive dog can be drudgery at times, rev things up a little bit and then try the "Play training" methods ("Hide & Seek", "Go Find" tricks etc.). 3. Avoid giving your unresponsive dog commands that you cannot enforce. At times, you give your dog a command that is neither enforced nor complied, the unresponsiveness starts to worsen. 4. Avoid giving your unresponsive dog commands that are incompatible. Tip: Giving an unresponsive dog commands such as "sit-down" is not recommended. In fact, there is no such treatment or method like "sit-down". Better say either "sit" or "down" when treating your dog. * The unresponsive dog knows what you want. * He can comply immediately to your commands during treatment. * Your unresponsive dog suffers from fear or confusion. 6. Never train an unresponsive dog when you're not in the mood. Always remember that earning a dog's respect will be never accomplished by treating them cruelly or in a harsh manner. The trick to accomplishing your treatment to your unresponsive dog: "Be Patient!" 7. Take note that good timing is essential throughout the whole treatment of an unresponsive dog. Tip: Prepare a plate of hors d'oeuvres for your dog. Once your dog walked into the room and smelled the hors d'oeuvres, chances are he'll jump up - a movement that signals the unfeeling dog to start behaving properly. 8. If possible, use your dog's name in positive ways. Note: Using the name of an unresponsive dog in concurrence to reprimands or punishment is a big no! Instead, make use of your dog's name in making good things happen during treatment. His name must always be a word that associates enthusiasm and support. 9. One command you give to your dog must be equal to one response. Repeating commands tunes the dog out, and that's where the "nagging" starts. Tip: Teach your dog commonly used commands first. Telling your dog to "Sit! Sit! Sit! Sit!" is neither an effective nor a useless way to issue commands. However, you can do something about it by simply giving your dog a single "Sit" command before luring him into the exact "sitting" position. PetFood.com is hosting a Free Pet Food for a Year Contest, where one (1) Grand Prize winner will win free pet food for a year. The free pet food will be in the form of a $50 gift certificate to PetFood.com supplied each month for a year beginning in October 2011. PetFood.com is your source for premium dog food and puppy food from all your favorite brands. They have a wide selection of dog food for our Labrador Retrievers from Canidae, Blue Buffalo, Holistic Select, Eagle Pack, Wellness and more. The Free Pet Food for a Year Contest ends at 5:00 p.m. ET on September 30, 2011 and is open to lawful permanent residents of the 50 United States or the District of Columbia and be 18 years of age or older. Enter now for your chance to win Free Pet Food for a Year! This is Steel (named after remington steele). He was a great hunting dog in his earlier years, and was always an awesome pet. He passed away this morning (8/13/11) at 12 years old after suffering from emphysema for the last few months. My deepest sympathy on your loss of Steel. 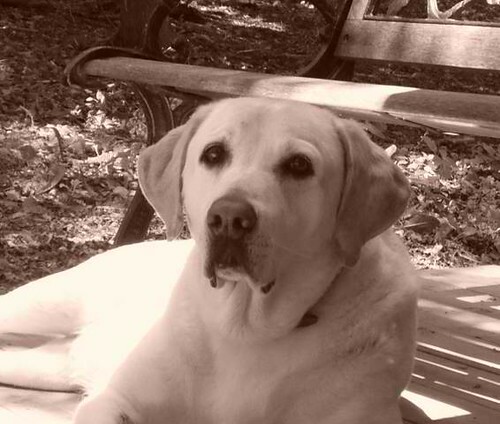 I appreciate you sharing these photos with me and all the readers of All About Labradors. 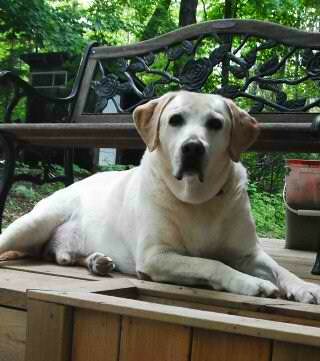 The loss of a Labrador Retriever is truly a sad and painful one but he'll always be with you in your heart. RIP Steel.